Quercus Editions, Ltd, 2014. First published in the United Kingdom in 2013. 240 pages. One look at this beautiful book, and I had to read it. 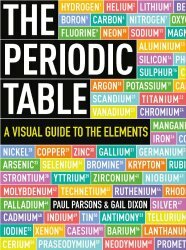 I had no idea I was interested in the chemical elements until I saw this book! The book consists of a brief introduction, and then a one-page explanation (in a few cases more pages) of each of the first 100 elements in the periodic table, with a large photograph of something related to the element on the facing page. In most cases, it’s a picture of the element, but also includes things like a picture of the atomic bomb dropped over Nagasaki next to Plutonium, a krypton-gas discharge lamp next to Krypton, and a bone scan next to Technetium. At the beginning of each element’s page, we see its place in the periodic table, its category, atomic number, atomic weight, color, phase, melting point, boiling point, crystal structure, and a diagram of its electrons. I read this book slowly, an element per day – and found it consistently fascinating. I’m not sure how much of the information stuck, but something about the big beautiful pictures made it seem so much more alive than high school chemistry class (which I loved, but this was very different).